Summary: Fund managers came into 2018 very bullish, with cash levels at 4-year lows and allocations to global equities at 3-year highs. 9 months later, global equity allocations are nearly the lowest since November 2016. Moreover, cash balances are high. Globally, investors are relatively bearish. How can this be? The reason is mostly outside of the US. While US equities are at all-time highs, both European and emerging markets are down in 2018. That has impacted investors' regional allocations in an important way. After being out of favor for 17 months, fund managers are now overweight US equities by the most since January 2015. It's at an extreme, and the US should underperform. Fund managers are now underweight emerging market equities by the most in 2-1/2 years; the region is now a contrarian long. Europe is neutral, as are global bonds. 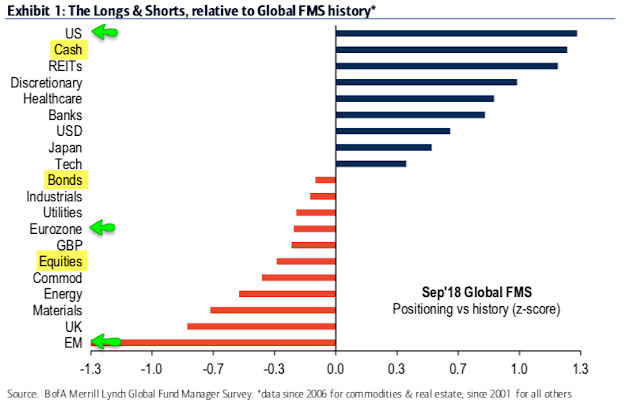 Overall: Relative to history, fund managers are overweight cash and underweight equities. Enlarge any image by clicking on it. 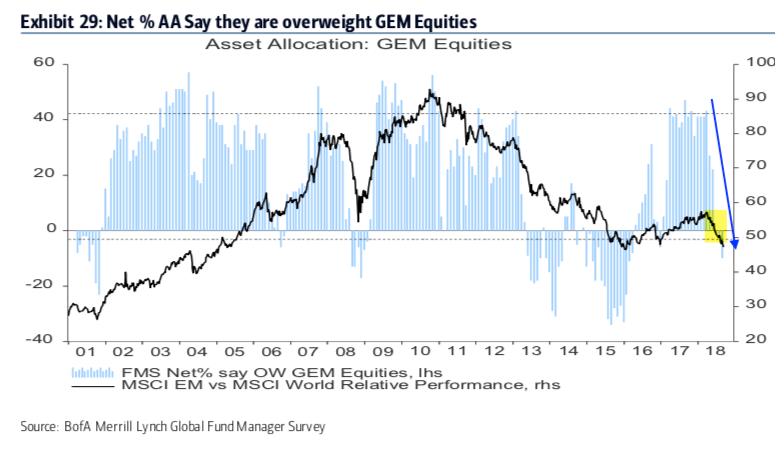 Within equities, the US is overweight while emerging markets in particular are underweight. This is a significant change from the past year. 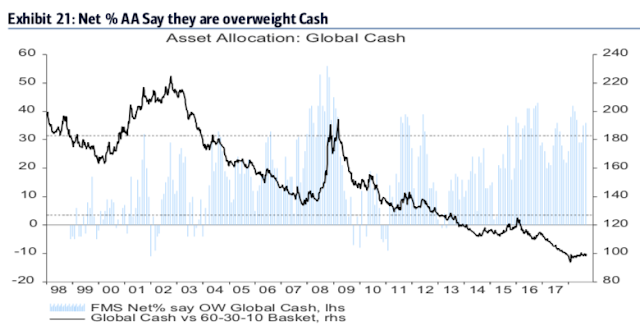 A pure contrarian would overweight emerging markets equities relative to the US and underweight cash. Fund managers' cash levels rose to 5.8% in October 2016, the highest cash level since November 2001. This set up a contrarian long in equities. Cash remained near 5% until November 2017, when it fell to 4.4%, the lowest level since October 2013. With the equity sell off earlier this year, cash rose to 5% in April and remains high in September; this is a tailwind for global equities. Likewise, fund managers are a net + 36% overweight cash (+1.2 standard deviations above its long term mean). In the context of a bull market, cash should underperform a 60-30-10 basket. Fund managers were just +5% overweight equities at their low in February 2016; since 2009, allocations had only been lower in mid-2011 and mid-2012 (notable bottoms for equities). 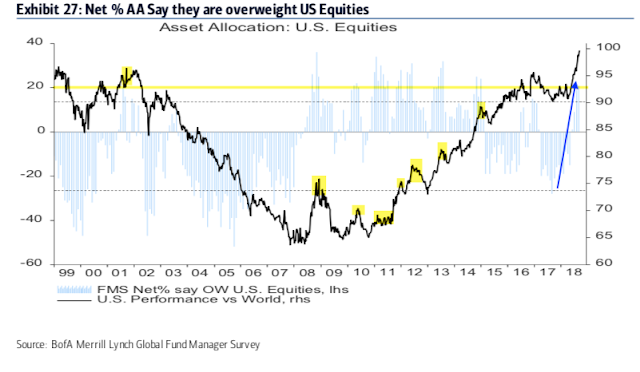 By January 2018, equity allocations had increased to +55% overweight, the highest level in nearly 3 years. Outside of 2013-14, over +50% overweight has historically been bearish. Our view was that "this is a headwind to further gains." After the February-April correction, equity allocations have fallen to 22% overweight in September (-0.3 standard deviations below its long term mean), close to the lowest since November 2016. This is below neutral, although investors haven't become outright fearful. On a net basis, fund managers expect profits to deteriorate in the next 12 months, among their most bearish views since February 2016. 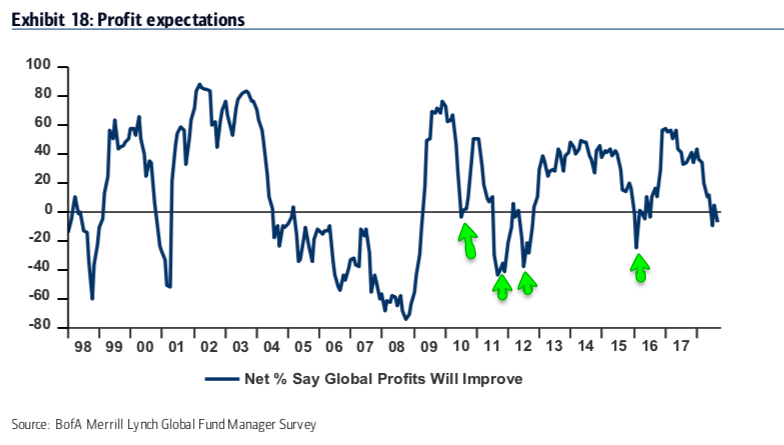 Negative profit expectations also marked equity lows in mid-2010, late-2011 and mid-2012 (arrows). Similarly, macro expectations have fallen hard in recent months: a net -24% expect a better economy in the next year - the lowest since equities bottomed in late 2011 - down from a net +47% in January 2018. This is also more pessimistic than the equity bottom in February 2016. 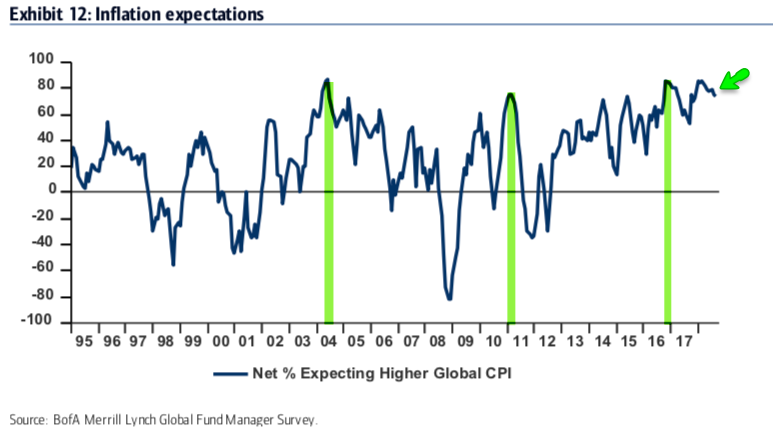 Investors are bearish on the global economy. Fund managers were underweight US equities for a year and a half starting in early 2015, during which US equities outperformed. From December 2016, to February 2017, investors overweighted US stocks. US equities underperformed their global peers. In September 2017, investors again became bearish US equities, giving them the lowest allocation in 10 years. US equities have since outperformed. 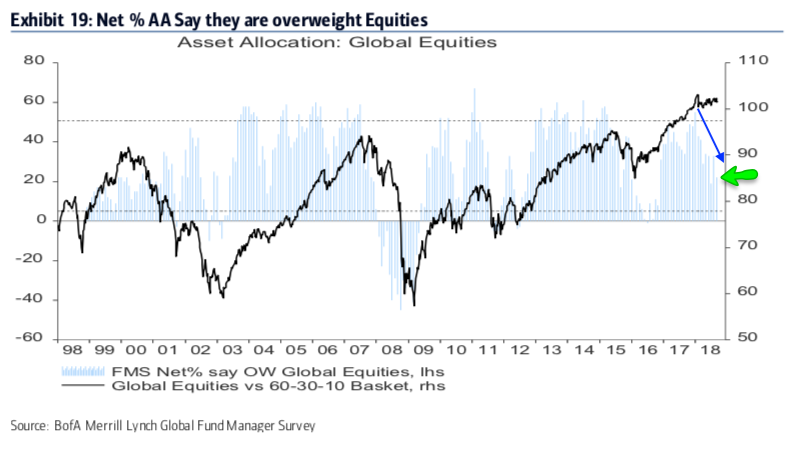 After being out of favor for 17 months, fund managers are now overweight US equities: allocations in September were +21% overweight. It's at an extreme (+1.3 standard deviations above its long term mean). Above +20% overweight and sentiment typically becomes a strong headwind (yellow shading). The US should underperform. Note that the relationship between performance and weighting worked less well in the prior expansion cycle (2003-07) as emerging markets outperformed developed markets by about 5 times. 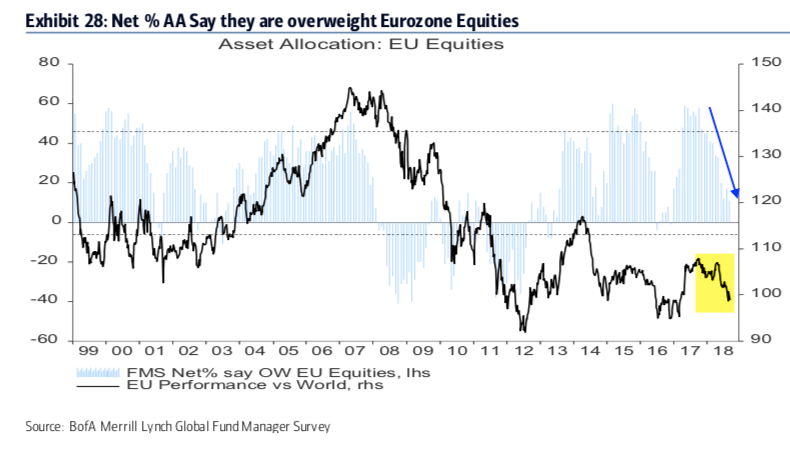 Fund managers had been excessively overweight European equities in 2015-16, during which time European equities underperformed. That changed in July 2016, with the region becoming underweighted for the first time in 3 years. The region then began to outperform. Allocations to Europe have been excessively overweight the past year, during which time the region has underperformed. Allocations fell to +11% overweight in September, an 18-month low. This is now neutral (-0.2 standard deviations below its long term mean). In January 2016, allocations to emerging markets fell to their second lowest in the survey's history (-33% underweight). As the region outperformed, allocations rose to +31% overweight in October 2016, the highest in 3-1/2 years. That made the region a contrarian short: emerging equities then dropped 10% in the next two months. Allocations fell to -6% underweight in January 2017, making the region a contrarian long again: the region then outperformed. 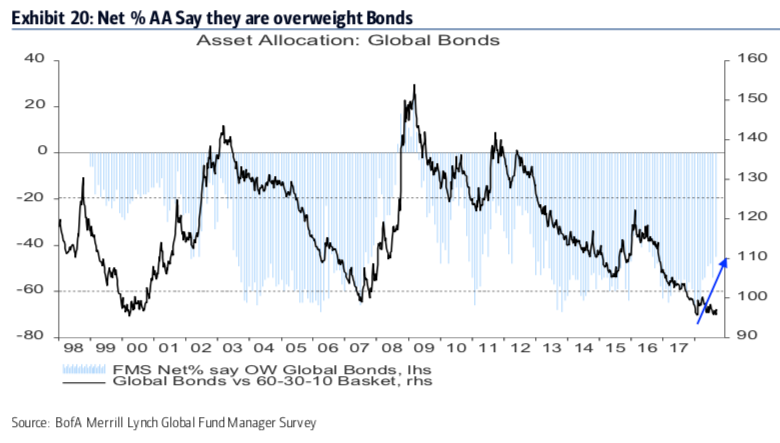 In April, allocations rose to +43% overweight, near a 7 year high. Since then, the region has underperformed the US by 2800bp. In September, allocations fell to -10% underweight, the lowest since March 2016 (-1.3 standard deviations below its long term mean). The region is now a contrarian long again. In July 2016, global bond allocations rose to -35% underweight, nearly a 3-1/2 year high. 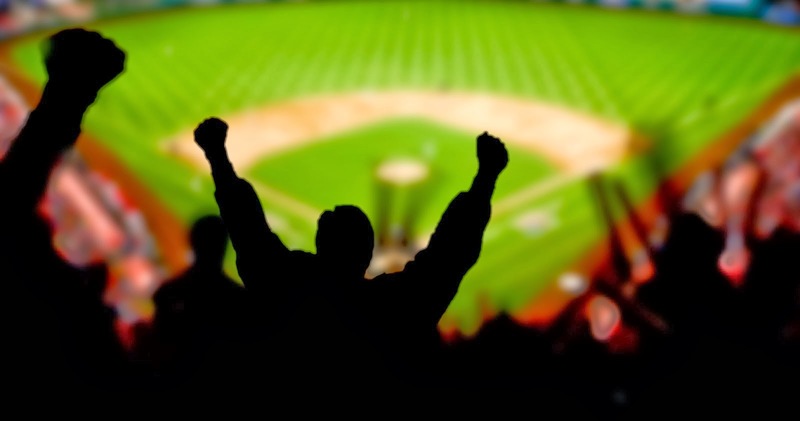 Bonds subsequently underperformed a 60-30-10 basket. In January 2018, allocations to bonds dropped to -67% underweight (-1.2 standard deviations below its long term mean), a 4 year low. This was a capitulation low, and US 10 year treasuries outperformed US equities (NYSE) by about 600bp until early August. In September, allocations rose to -45% underweight (-0.1 standard deviations below its long term mean). This is close to neutral and thus there is no longer a contrarian tailwind behind bonds. That said, 74% of fund managers expect higher inflation over the next 12 months; this is near the 14 year high set in April. Higher inflation is a strongly consensus view (first chart). In the past, the consensus view has corresponded to a drop in US 10-year yields in the months ahead (second chart). 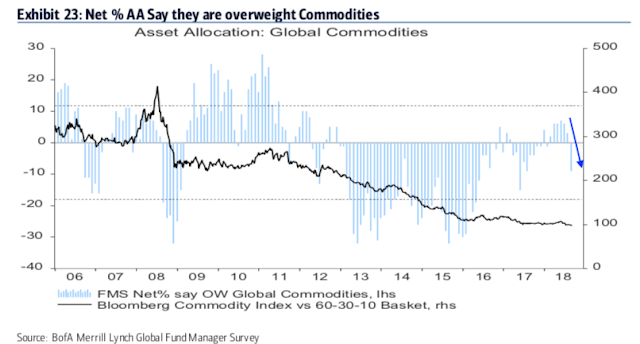 Higher inflation expectations often goes in hand with higher commodity allocations, but in September, fund managers' dropped exposure to a net -9% underweight (-0.4 standard deviations below its long term mean). Cash: The typical range is 3.5-5.0%. BAML has a 4.5% contrarian buy level but we consider over 5% to be a better signal. More on this indicator here. Equities: Over +50% overweight is bearish. A washout low (bullish) is under +15% overweight. More on this indicator here. 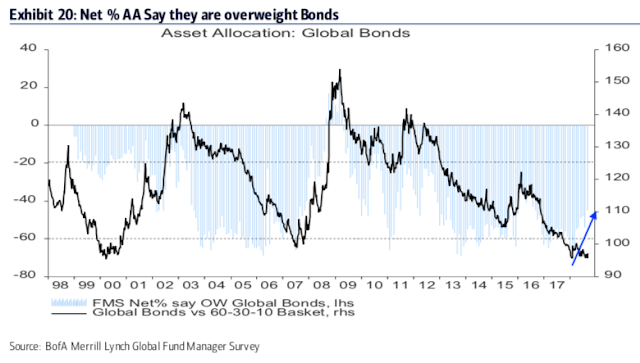 Bonds: Global bonds started to underperform in mid-2010, 2011 and 2012 when they reached -20% underweight. -60% underweight is often a bearish extreme. Commodities: Higher commodity exposure goes in hand with improved sentiment towards global macro and/or inflation.